When I teach creative writing, I notice that novices frequently write as if describing a what a TV screen would show if a camera had zoomed in for a close-up of their narrator’s face. By contrast, an experienced writer would rely on a much wider range of storytelling techniqes, including dialogue and interior thoughts. The point I tried to make in the above example is that cutting away to a character’s facial reaction is a standard tool in the toolbox of a TV storyteller. But a writer of fiction has access to all the memories, fears, dreams, and imagination of the first-person narrator. If the author chooses a first-person narrator, but then has that narrator communicate her emotions by telling the reader, “As I carefuly inspected Lord Spiteworthy’s handiwork, a cold look of determination clouded my hazel eyes,” concern clouded my eyes,” the reader is so cut off from the interior life of the narrator, relying on the narrator’s description of what an external observer would see, that it really makes no sense for the author to choose a first-person narrator. 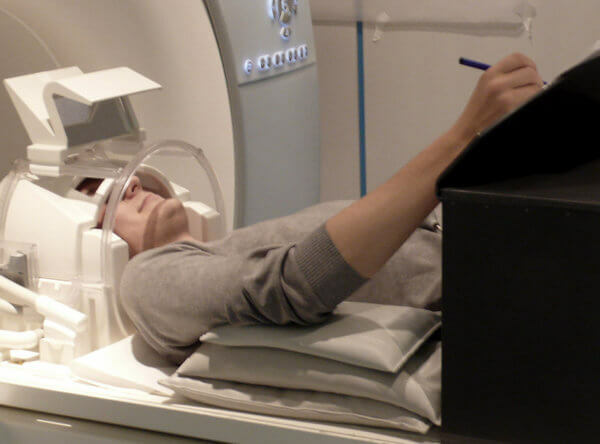 For the first time, researchers have used fMRI scanners to track the brain activity of writers as they created fiction. The results have drawn strong reactions from other scientists…. During brainstorming, the novice writers activated their visual centers. By contrast, the brains of expert writers showed more activity in regions involved in speech. “I think both groups are using different strategies,” Dr. Lotze said. It’s possible that the novices are watching their stories like a film inside their heads, while the writers are narrating it with an inner voice. 18 May 2015 in Health, Language, Literacy, Science, Speech, Writing.